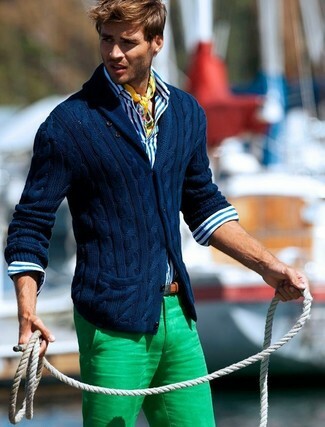 Wear a white and navy vertical striped long sleeve shirt with green chinos for a casual level of dress. 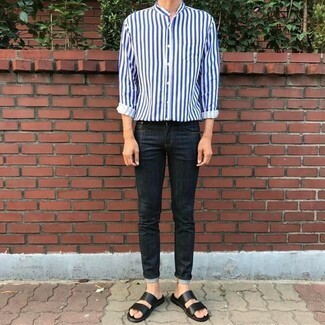 If you're all about comfort dressing when it comes to your personal style, you'll love this easy pairing of a Kiton striped button up from TheRealReal and black skinny jeans. Choose a pair of black leather sandals to make the look current. Pair a Kiton striped button up from TheRealReal with light blue jeans to show you've got serious styling prowess. Rock a pair of black high top sneakers for a more relaxed feel. 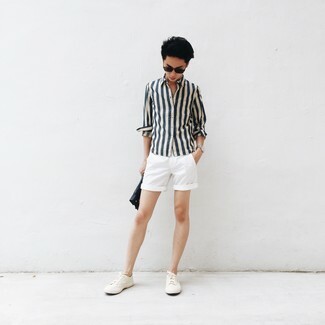 If you're scouting for a casual yet stylish look, pair a Kiton striped button up from TheRealReal with white shorts. Both items are totally comfortable and will look great together. When it comes to footwear, this ensemble is complemented wonderfully with white canvas low top sneakers. If you're after a casual yet stylish look, reach for a Kiton striped button up and black chinos. Both items are totally comfortable and will look great together. If you're looking for a casual yet on-trend ensemble, make a Kiton striped button up and navy jeans your outfit choice. Both garments are totally comfortable and will look great paired together. Rocking a pair of navy suede tassel loafers is an easy way to add extra flair to your outfit. A Kiton striped button up and yellow chinos are absolute essentials if you're putting together an off-duty wardrobe that matches up to the highest style standards. Complement your getup with brown plimsolls. 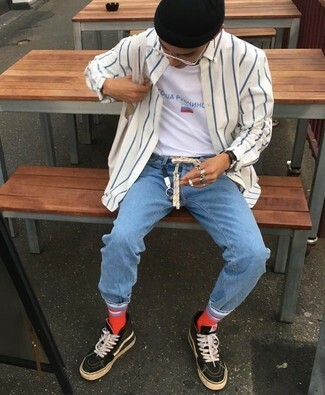 If you prefer practicality dressing when it comes to your personal style, you'll love this cool pairing of a white and navy vertical striped long sleeve shirt and mint skinny jeans. Make tan suede desert boots your footwear choice to show your sartorial savvy. 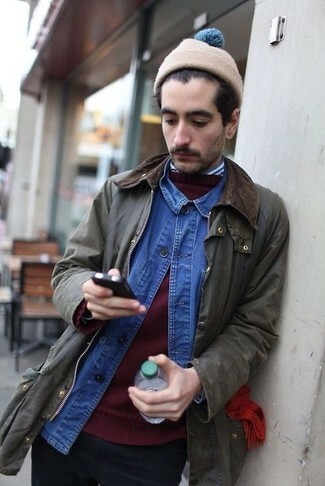 If you're after a casual yet stylish outfit, pair a Kiton striped button up with blue jeans. Both items are totally comfortable and will look great together. Break up your ensemble with more casual footwear, like this pair of violet athletic shoes.